Twenty years ago, I used to make my own door wreaths. I know, I can't believe it either (this was before I had discovered quilting as a way to spend all my time and money). Back then, you just couldn't buy the sort of thing I was after, so I made them. I spent hours - no, more like entire days and hundreds of dollars putting together a wreath that would make a statement. My favourite seasons were Spring and Autumn, although I made one for all four as well as birthdays and Easter and I have long suffering memories of drying huge bouquets of hydrangeas and various leaves for my staple supply. Looking back, I just can't believe how much work it all was. Even as I type this, I'm actually shuddering at this brief walk down memory lane. Boy, how I would have loved to just be able to purchase a lovely door wreath for the season and be done with it. Well, I'm happy to report that this is just what I'm doing today. No more will I while away hours toiling over dried stems when there's a design backlog, a chair leaning over with the burden of blocks and quilt WIPs stacked to the ceiling. I have gone modern. I have my eye on the one above. Do you like it? I'm taken by the pansies. I'm all in a pansy kind of mood because of HOYH. 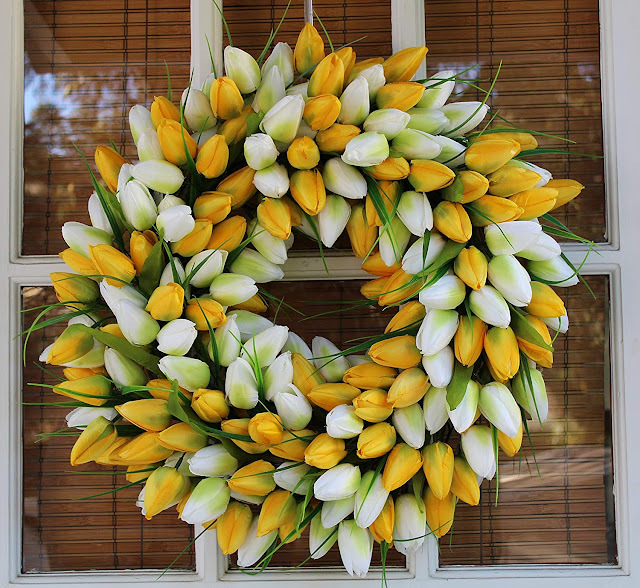 My DD (who has inherited the need for wreaths of all kinds) purchased this tulip beauty below, and we're all happy about it. We've decided to pool our wreaths so that we don't double up and have an interesting enough supply to rotate all year long. So far, I've lived without wreaths for nearly 15 years now but it feels like 15 years too long. I am totally ready to get back into loving my front door again. I'm pretty sure the pansies are going to find their way to me and I'm going to spend the rest of my precious Wednesday working up a storm on my two HOYH beauties..
And that's how it should be.. on with the Quilt WIPs! what crafts did you indulge in before you found quilting?? I adore your daughter's tulip wreath -- is it artificial tulips? They look so real, like they were just cut from your garden! 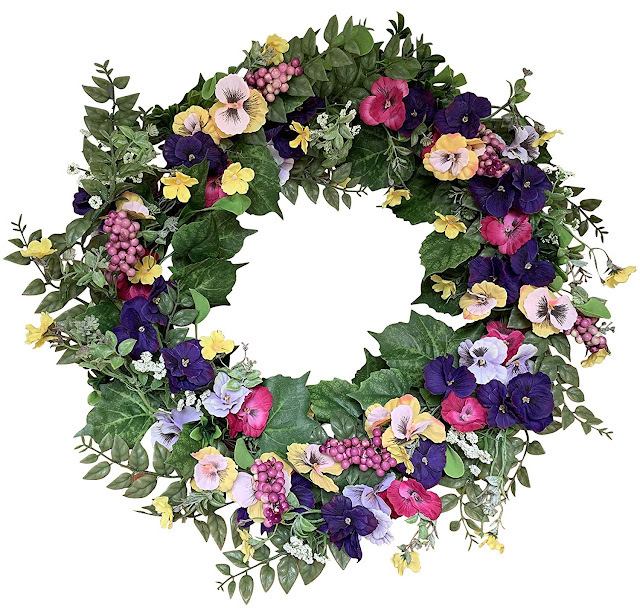 The pansy wreath you're considering is beautiful, too. I am not at all surprised to hear that you used to make handcrafted wreaths for every season. And no, that was not wasted time, money, or creative energy -- I believe that the time you spent creating wreaths carries over into your beautiful floral-rich appliqué designs. You are intimately familiar with the flowers, and that's why you're able to portray them with so much mastery and realism in fabric. Cross stitch - loved to cross stitch. Now I have a machine that does everything and I read blogs! What a mess! I made an Easter Wreath, but not as "elegant" as the tulip or pansies - it is made with mesh and the back end of the bunny hopping through the middle. 'Wrapt In Love' My New Free BOM!